One of the best ways to help make Oregon a better and more inclusive place for people with developmental disabilities and their families is to connect with advocates who are working on policy changes at the state level. You can make a positive difference by getting to know the legislators from your Oregon district and communicating with them on a regular basis about issues that matter to people with developmental disabilities and their families. The Oregon Legislature convenes in Salem each year, starting in February. 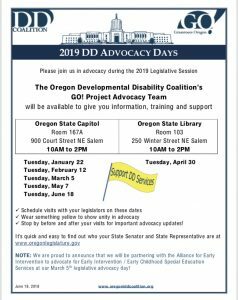 A DD Advocacy Day is scheduled regularly during this annual session. On these days, people with disabilities, family members, advocates and others travel to Salem to talk with lawmakers face-to-face about critical issues that affect their lives. The Oregon DD Coalition GO! Project Advocacy Team will be available to provide you with information, training and support on Advocacy Days at the Capitol during legislative session. Information about key issues facing the DD community. Training in how to tell your story and have successful conversations with your elected representatives. Resources including talking points and fact sheets that you can take with you when you talk with lawmakers. Support before and after your appointments, to help you prepare and to hear about your experiences afterward. We often walk people to their appointments or sit in on meetings with them. The Oregon Developmental Disabilities Coalition (DD Coalition) also looks out for the interests of people with disabilities but is a distinct organization from OCDD. Many DD advocates are active with both the DD Coalition and OCDD. 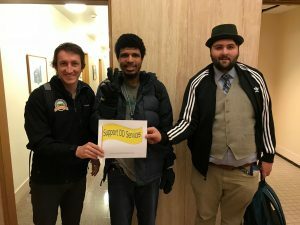 The DD Coalition’s mission is to promote quality services and supports that respectfully further the rights, equality, justice, and inclusion for all Oregonians with intellectual and/or developmental disabilities and their families. The DD Coalition can provide a legislative advocacy training session at a location in your community for you and a group of people. To learn more and request a training session, contact the DD Coalition at oregoniddcoalition@gmail.com. The “go” in GO! Project stands for Grassroots Oregon, a collaboration between OCDD and the DD Coalition to connect regional advocates, identify concerns in communities across Oregon, and provide technical assistance about issues that affect people with developmental disabilities. a timely basis as DD policy issues and bills move through the legislative process at the state and federal level. GO! Bulletins are delivered weekly during the Oregon legislative session and include specific opportunities, such as the Adopt-a-Legislator program, for how to get involved.